On February 15th, 2018, key organizers of Bernie Sanders and Jeremy Corbyn’s insurgent campaigns delivered a message loud and clear to the NDP federal convention in Ottawa: radical politics are not a liability for the progressive left in Canada, but rather the path to power and victory. Courage to Leap, co-organized by The Leap and Courage, brought over 450 people together at the Museum of Nature in Ottawa — and over 5000 more via livestream — to share that transformative political vision and to experience first-hand the innovative mass organizing techniques that our friends in the US and UK have deployed to such thrilling effect. It was a powerful night, one bursting with wisdom, momentum, and a sense of real possibility. Here’s a round-up of media coverage, photos, and memorable quotes. 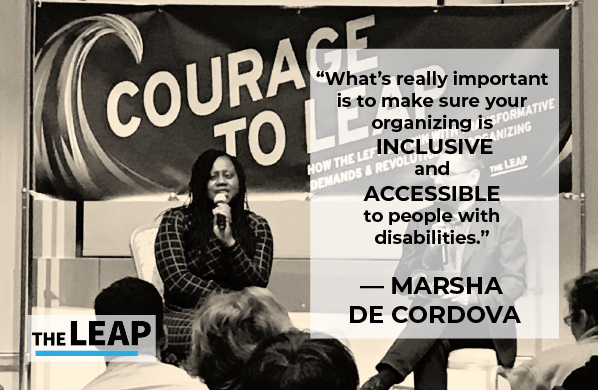 Check out #CourageToLeap on Twitter for more quotes and live updates from dozens of people at the event, including the official accounts of The Leap and Courage. 1. “Are Leap movement and advisers to Bernie Sanders and Jeremy Corbyn crashing the NDP’s party?”, The Toronto Star, February 3. 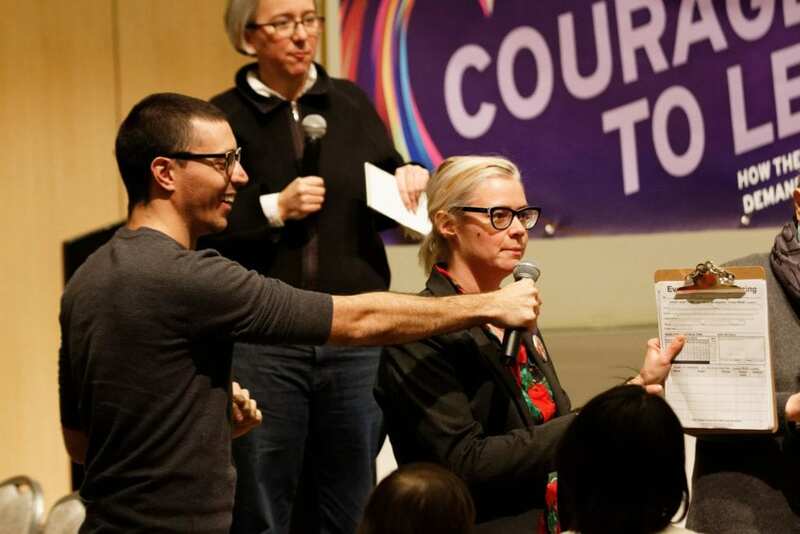 A two-page spread (and front-page headline) by Susan Delacourt discusses why the time is right for an injection of boldness and radical ideas into the NDP, and how Courage to Leap connects with global movements for political transformation. 2. “We’re bringing the Sanders/Corbyn momentum to Canada”, The Globe and Mail, February 9. 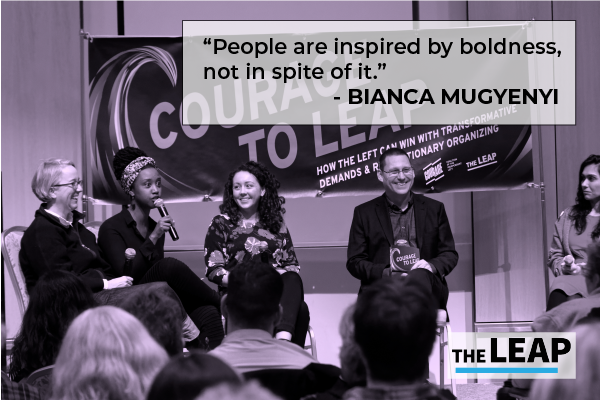 An op-ed by Becky Bond (senior adviser to Bernie’s campaign), Adam Klug, and Emma Rees (co-founders of Momentum UK) on why they were excited about coming to Ottawa for Courage to Leap. 3. 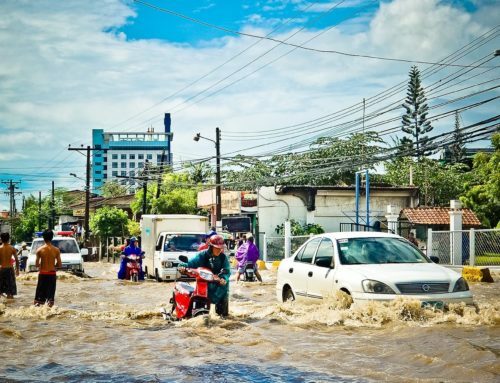 “Climate change won’t wait for political change”, The Toronto Star, February 15. 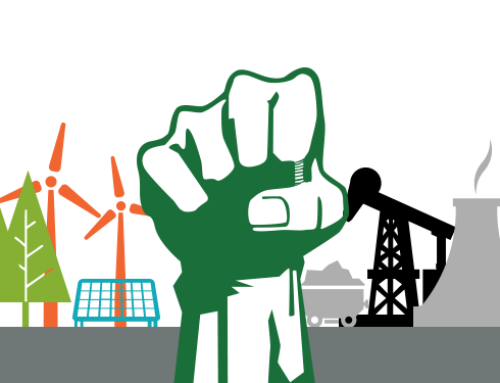 Linda McQuaig writes on the Leap Manifesto and why Big Oil’s political power blocks government action on climate change. 4. 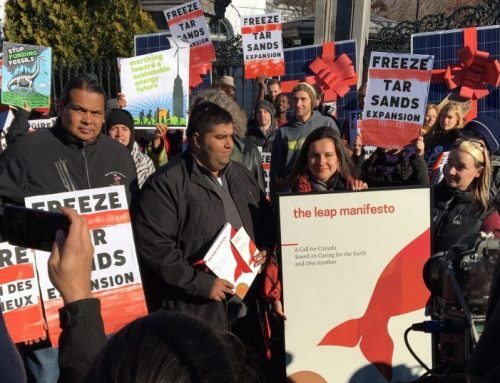 “New Democrats hear Leap Manifesto push on eve of convention”, National Post, February 15. 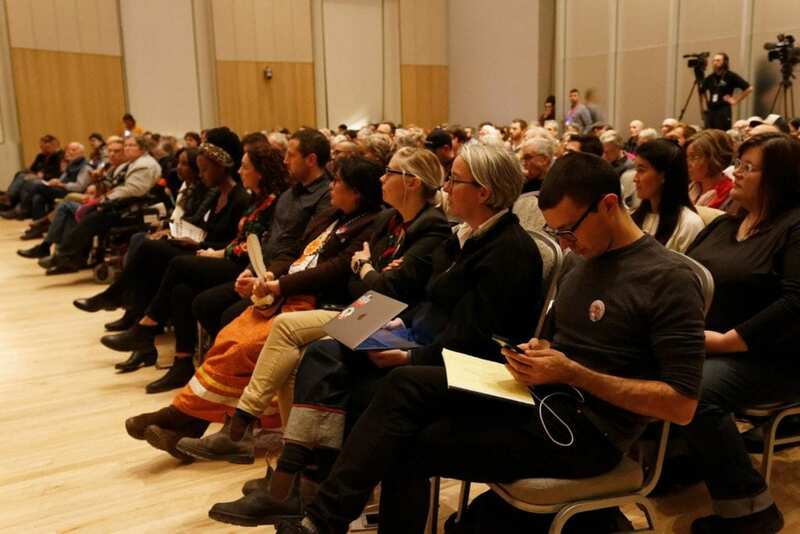 Lee Berthiaume of the Canadian Press reports in detail on the Courage to Leap event, and the challenges it posed to NDP convention delegates and everyone tired of the status quo in mainstream politics. 5. 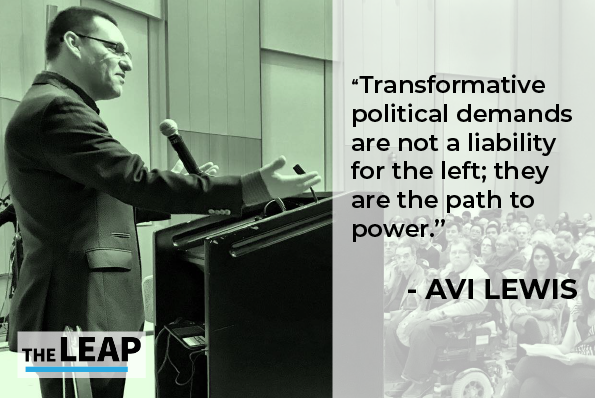 Avi Lewis and Becky Bond on CBC Radio’s The House, February 16, discussing how big ideas are the path to power for the left. Becky’s first answer on what the Leap Manifesto means to her personally is one of our proudest media moments. 6. A rare sighting inside the mainstream bubble: Marsha de Cordova, Becky Bond, and Avi Lewis on CTV’s Question Period, February 16. A lively conversation about the possibility of a progressive surge in Canada, and why some of the policies needed — stopping pipelines, free education, living wages — are not that radical at all. 7. Inside the Left’s Race to Capture Berniemania in Canada, Vice, Wednesday Feb 21. A smart and fair piece of critical analysis by Jamie Maxwell, evaluating the state of play on the Canadian left in relation to the US and UK. 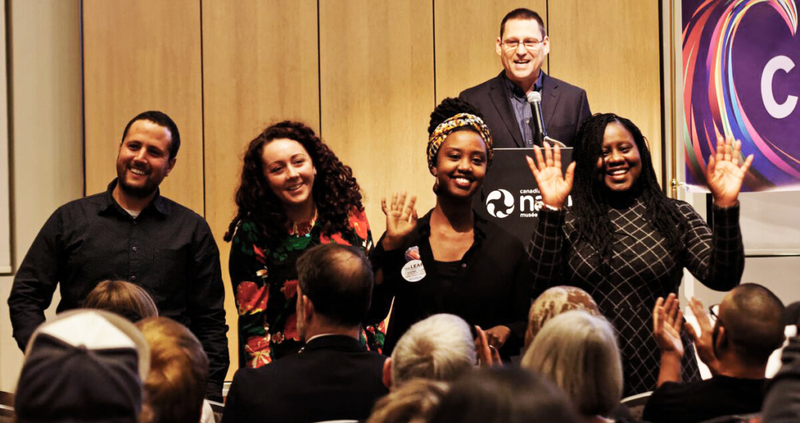 Courage to Leap speakers — including Zack Malitz, Becky Bond, Jill O’Reilly, Elder Verna McGregor, Adam Klug, Emma Rees, and Bianca Mugyenyi — sit in the front row of a packed room at the Canadian Museum of Nature. PHOTO: Mark Edwards. From left to right: Adam Klug, Emma Rees, Bianca Mugyenyi, Avi Lewis and Marsha de Cordova face the audience. PHOTO: Mark Edwards. 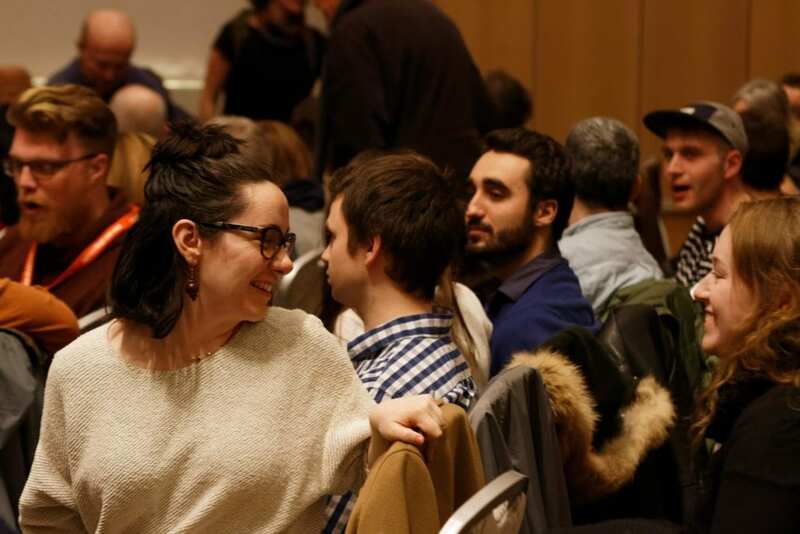 Members of the audience get to know each other during a barnstorm for Joel Harden, ONDP candidate for Ottawa Centre, led by Becky Bond and Zack Malitz. PHOTO: Mark Edwards. During the barnstorm, Zack Malitz holds up a microphone as Jill O’Reilly announces a canvassing session for Joel Harden on Saturday morning in Ottawa. PHOTO: Mark Edwards.